In Japan, carrying speed-radar detectors on your car is not illegal. People try to avoid speeding tickets by knowing where radar gun is pointing you beforehand. And when some machine is a commodity, there is always a room to ship a product with moe-flavor for people who love it. Yupiteru’s radar detector Lei01 [J, beware, the page talks in female voice] is the one which guide you where radar guns are with a virtual anime girl Lei Kirishima [J] with 1,600 recorded voice messages (of course by a professional anime voice actress) and more than 3,600 frames of pictures. Those animations and voices include seasonal events. Extra data updates such like “winter cloths” is being offered. If your driving is rough, she will have bad moods and change her attitude and how she talks to you. This is a fan-taking video when a car with Lei01 passes a speed radar. The right one is an ordinary radar. The Lei01 is only made and sold 2,000 units on the website. The price is 46,800 yen(US$599). For a case you drive with someone whom you do not want to show your anime assistant, one-button-click will change it as a regular looking radar detector. Lei Kirishima’s Facebook page [J] – you may be able to communicate with other Lei01 owners. 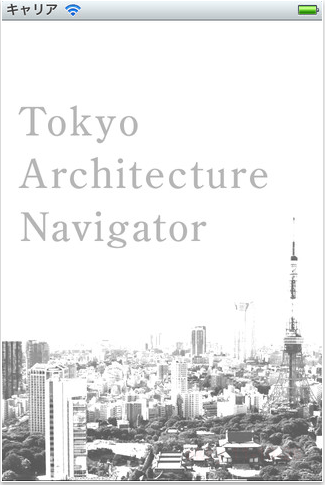 “Tokyo Kenchiku Navi/Tokyo Architecture Navigator” is a new English/Japanese bilingual iOS app by real-estate information website R-Store, which covers about 1,000 Tokyo buildings designed by architects like Tadao Ando, Arata Isozaki, Kazuyo Sejima, etc. The app contains around 3,000 photos of the buildings, information of each building such like the designer’s name, address, year established, etc. 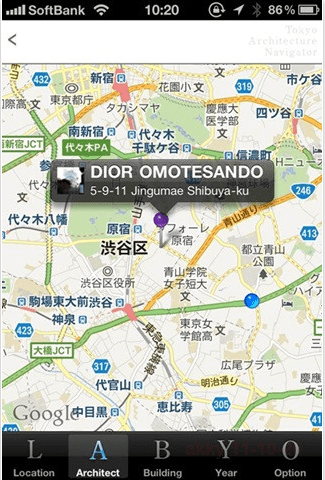 By GPS, you can list the buildings around you on map, route guide to a building as well. The new buildings info are planned to be updated every year. Android version is under development. The price is 600 yen. Mapion [J] under sponsoring by NTT Docomo [J] has announced the release of the location based game “Sekai Magical Daiboken” [J] (World Magical Adventure), which allows Docomo users to play overseas, for a one year fixed term starting September 8th (Thursday). Currently Mapion offers the cell phone stamp library game “Keitai Kuni Tori Kassen” (Cell Phone Country Taking Battle) which uses location information service, and since its release users have requested that they want to enjoy “Cell Phone Country Taking Battle” not only within the country but also on overseas vacations and business trips. As a result, Docomo began to offer the overseas packet fixed price service “Kaigai Pake Ho-dai” (Unlimited Overseas Packet), an overseas version of a location based game such as “Cell Phone Country Talking Battle” was planned, and thus it was decided that “World Magical Adventure” would be offered. The target service area will be 29 countries / regions including Japan (21 countries / regions from service launch time, and from October, 8 more countries will be added), and smartphone support is planned from around the beginning of December. The main point of “World Magical Adventure” is to expand your world view and become the “World Adventure King” while clearing adventure quests in the foreign travel destination’s country / region. Searching for 60 established spots in the world’s 29 countries / regions, users can get limited overseas avatars and rare items, Coban (the currency in the game), and so on, by registering location information with a cell phone which handles GPS in actual places visited overseas. In addition, the game also allows “Cell Phone Country Taking Battle” users who complete the reference book adventure quests as well as capture each country’s spot to be bestowed with a castle town background or a “Cell Phone World Taking Battle” avatar which can only be obtained in that particular target country. Colopl [J] is planning to implement the sports game watching “Pro Baseball! Colopl Series” [J] to link with their cell phone geo-location game “Koroni-na Seikatsu” (Colony Life). This will be their first attempt to collaborate with professional sports. The “Pro Baseball! Colopl Series” is for sales of special Colopl Card linked game tickets for 16 planned matches (September 2, 2011 – October 9) of pro baseball Central League regular season games at Meiji Jingu Baseball Stadium sponsored by Tokyo Yakult Swallows [J]. Users subscribe to special Colopl Card linked tickets, and by entering the serial number printed on the back of the card into “Colony Life,” acquire restricted items that can be used within the game. The special Colopl card and items’ original design perfectly fit the pro baseball theme, and as planned, Colopl users can also enjoy watching baseball as a fan. Yumemi has announced that they are joining forces with Booyah, maker of the American location information social game “MyTown” which has over 4 million users. From now on, “MyTown” will be developed in Japan. tied to such corporations as Disney, MTV, Travel Channel, H&M, Adidas, P&G etc. and is said to be the most successfully monetized location game in America. Yumemi is not going to simply localize the American version of “MyTown,” they are going to develop an evolved version exclusively for Japan. 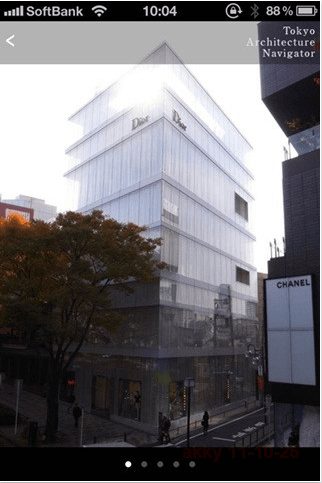 The service is planned to be opened up this Fall.